According to the book, Pests of the Garden and Small Farm, you can control bristly oxtongue by removing rosettes by hand before stalks develop. Read more about this weed on the bristly oxtongue page in the UC IPM Weed Gallery. Not sure if the weed you are seeing is bristly oxtongue? 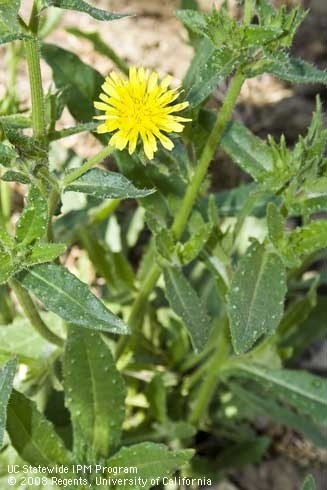 Visit UC IPM's weed identification key or see photos and features of other weeds in the Weed Photo Gallery.